A rom-com works—and this one sure does!—only when the writer and the cast have fun doing it. By that reckoning , the writer-director Mudassar Aziz and his delectable cast must have enjoyed themselves as though there is no tomorrow. As far as sequels go Happy Phirr Bhaag Jayegi (HPBJ) is a long-legged sprinter. It hops skips and gambols through a maze of amusing incidents woven around some of the most wittily constructed yet inoffensive ethnic jokes seen and heard in Hindi cinema, notorious for insulting cultures and nationalities. Most of the comedy of mistaken identity is set in China , and that in itself unique. The last time a Hindi film took us to that vast country of illimitable possibilities was when Nikhil Advani made that unintentionally hilarious Akshay-Deepika fiasco Chandni Chowk To China. Straightaway , the ‘Happy’ sequel doesn’t treat Shanghai and its suburbs as touristic spots. The location is a character, not a prop. Cinematographer Sunil Patel is very clear he isn’t shooting ‘An Evening In Shanghai.’ Thank you. The same goes for every actor, chosen because he or she just belongs by right to this zany world of insatiable adventure. This time there are two Happys in the script. Happy no.1 Diana Penty (why don’t we see more of her on the screen?) makes a welcome appearance with husband Ali Fazal. But the focus this time is on the new addition Happy no.2 played by Sonakshi Sinha who is practically in every frame as the runaway jilted bride. Sinha, takes charge of the plot with confidence and grace, giving her best shot to what could possibly be her most accomplished performance to date. She isn’t alone. HPBJ oozes acting talent. While the Indo-Pak fracas between Jimmy Sheirgill and Piyush Mishra from the first film is carried forward here without the tu-tu-main-main dragging its tired feet, it is the newcomers in the story who inject a fresh verve to the madness. Jassi Gill as a sad lonely dumped Sardarji in China singing Karaoke in dimly lit clubs to Sunny Deol songs who suddenly finds more excitement in his life than he had bargained for, is absolutely delightful. He is the loser who has nothing to lose except boredom, out on an extended adventure binge with a girl who has everything to lose but is determined not to. The writing is exceptional. HPBJ is one the most neatly-scripted comedies in recent years. While every character comes alive with situations and lines that are often hilarious, sometimes not that funny (that’s life!) I must make mention of two add-ons in the sequel who are priceless. Denzel Smith playing an Indian saint-rogue in China who cooks and connives his way through a labyrinth of high-level misdemenaours is outstanding. From that hypnotic baritone to his culinary expetise, Smith gives his character a sufiyana diabolism. Loved it! Oh yes, there was a runaway bride in the first part. There is a runaway bridegroom in the second. He is played by Aparshakti Khurrana, one of the bravest most honest young actors at work on a character that not many actors in Bollywood would touch with a bargepole. These desi characters and some tongue-in-cheek Chinese caricatures go a long way in making this sequel a happy happy experience. Sure, not all the gags and jokes work. Some lines meant to be exceptionally funny fall flat on their face. But writer-director Mudassar Aziz never loses sight of his flight into a world where cultural, ethnic, personal and interpersonal crises are magically and dissolved and alchemized . 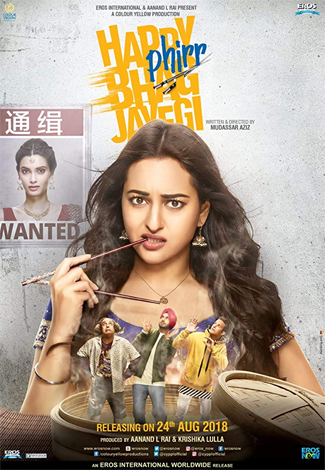 Far cleverer than it is willing to admit, Happy Phirr Bhaag Jayegi sparkles with a sense of parodic profundity brought on by characters who are at a loose end, and not afraid to tackle their situation headlong with humour and fortitude. At one point while travelling together, Sonakshi’s Happy asks Jassi Gill’s Khushant Singh why his wardrobe is filled with women’s clothes. “I put them on when I am alone,” he retorts wrily. That line returns to haunt the film much later when we see another character cross-dressing to dance to Mera naam chin chin choo, that Howrah Bridge evergreen where Helen batted her ‘chinky’ eyes so satirically . This time those fluttering eyelashes are actually a wink . Don’t mind.